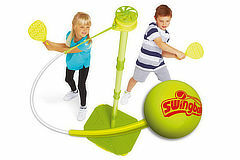 This set gives your little ones the perfect introduction to Swingball. The tangle free spinner makes sure the ball height stays steady and stops it from becoming twisted around the pole. The soft foam ball is easy for children to hit and propel with less force. It also gives you an All Surface base allowing you to play anywhere. The base converts into a carry case afterwards making it easy to transport. The prize draw closes on 23rd March at 8.30pm.